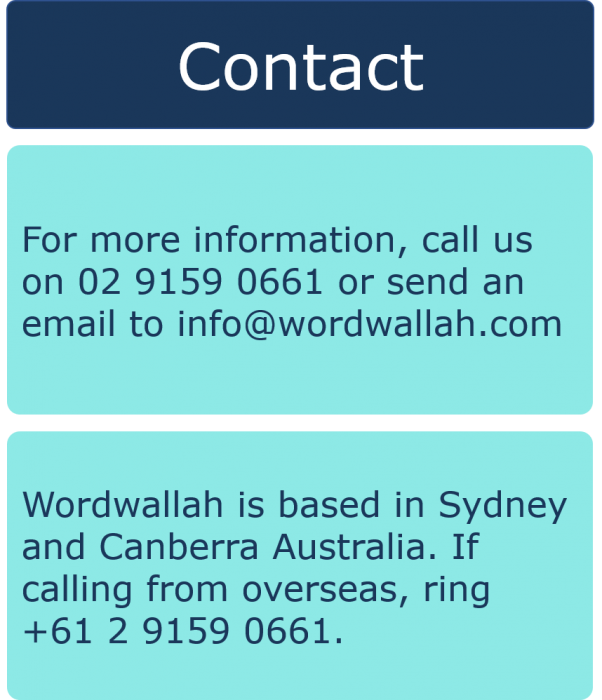 Based in Sydney and Canberra, Australia, wordwallah is a preferred supplier to over sixty federal and state government departments and agencies. Wordwallah supplies editorial and content writing services to blue-chip corporations, in sectors such as finance, training, publishing, law, medical and health, and science. Whether you need contract editorial staff on an on-going basis or for small one-off projects – we provide a one-stop, professional solution. Founded in 2003 by corporate communications expert Mike Holland, wordwallah has an extensive network of writers, editors, proofreaders, and indexers – each with at least ten years’ experience in their field. You receive exactly what you ordered, on time and within budget. I was tasked with managing the production of various manuals and plans. I needed to find an editor to assist me in this role and I asked my predecessor for help. He recommended wordwallah based on the high-quality work wordwallah had produced in the past. My predecessor was particularly impressed by your editors who had gone to the trouble of carefully checking and updating references in the reference list. Based on his assessment I felt confident in selecting wordwallah. Your service offers quick turn-around times, accurate proofing and up-to-date formatting. Being given the opportunity to review documents and answer questions raised by editors during the editing process is also beneficial as this ensures the document is accurate and meets my requirements for the finished product. I would recommend your services to any government or private agency producing technical documents to ensure a professional finish. Over 15 years, we’ve developed a lean project management approach that ensures you stay in full control of your editorial projects. We begin your project by working closely with your key decision makers. It’s your project, so we’ll discuss what you want to achieve, the timeframes and your message. Once we’re all on the same page, we’ll develop a comprehensive schedule of activity. This sets out the key objectives and milestones we’ve agreed to meet. We send you regular updates as we work on your project. You’ll have close oversight of your project, letting you influence the work and request changes where necessary. Occasionally a project brief may need to be altered once underway. If so, we will confirm these changes with you in writing as soon possible, so there are no awkward surprises at the end. Wordwallah provides experienced in-house or virtual contract staff – for a week, a month, a year or more – whatever you need to get your project done. We only contract experienced professionals, making it easy for you to find quality hires at short notice. We provide the full scope of content writing services to government departments and agencies and corporations. These include web content, newsletters, articles, reports, fact sheets, capability statements, case studies, summaries and more. Wordwallah can set up and manage your social media pages, distributing content to the widest audience possible via Facebook, LinkedIn, Twitter, YouTube, Instagram, and Pinterest. With a background in both government and corporate communications, we have extensive experience in producing winning tender responses. We’ll give you the best chance to win by outlining how your business uniquely meets the needs of your prospective client. Turn complex, bureaucratic or technical material into clear, readable content. Among other sectors, we provide plain language editorial services to government, finance, law, IT, science and medical and health. Wordwallah offers copy editing and substantive/structural editing. We’ll ensure that your documents are clear and error-free. Once you’ve finished the design of your critical documents, we can provide professional eyes for that final check. This not only includes ensuring the content remains intact, but also checks the visual aspects such as orphans and widows (a first or last line of a paragraph falling onto a separate page), and rivers (a line of white running diagonally through text). To help your readers find information quickly, we can produce a searchable index for your annual reports, journals, books, databases and websites. We contract indexing professionals with experience in your particular topic area. Wordwallah can supervise all stages of your production process, from writing and editing, to design, printing and distribution. We’ll keep your projects on time and under budget. Enter your details on the right for regular tips on how to communicate clearly, build your credibility and get your message across in corporate and government communications. Claim your FREE Tips and Tricks! © 2017 wordwallah. All Rights Reserved.